A look at the Jelly Belly. Eat up! In your Weirdest Food news of the month -- but not the year -- U Street Music Hall (1115A U St. N.W.) has debut its brand-spanking-new food menu, and if you guessed prime rib, filet mignon or lasagna... we're sorry, you're not only wrong but you've obviously never been to U Street Music Hall. Think more along the lines of the Jelly Belly or the Sloppy Cho. And yes, we're serious. The Jelly Belly is, according to the venue, a "grilled glazed doughnut with a cut of house-cured pork belly." There's nothing wrong with the bun tasting a little sweet, right? Of course, if that doesn't quite suit you, you can try the Sloppy Cho, a "Sloppy Joe filled with Chashu pork served on a toasted bun with Toki-made barbecue sauce, topped with cilantro." Does that sound more appealing to you? And that's not all. Visit the website to learn more about the new menu items, like the WTF Dog (that actually doesn't sound that shocking -- it's just filled with cheese, for goodness sake's). 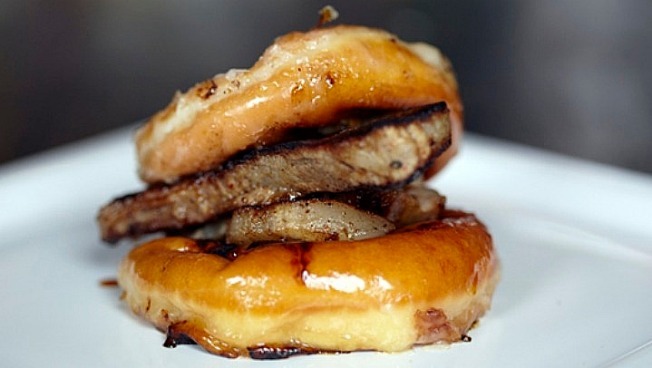 And there's nothing else with a doughtnut/pork combo, at least.